A very happy new year to everyone. 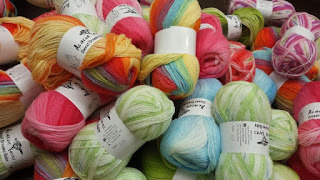 Another year over, resolutions to keep (or break) and a great selectio of new yarns have arrived at The Yarn and Fiber Company for the new year, we will try to get them all up online this week. We have added a lot of new colors to our Artfelt (needle and wet felting) roving selection. A lot of new sock yarn colors from Sereknity, and we are excited to have added new yarns from Blue Heron, including their new Rayon Metallic.